Toronto Blue Jays rookie pitcher Chris Rowley throws a pitch against the Pittsburgh Pirates at the Rogers Centre on Saturday, Aug. 12, 2017, in Toronto. Chris Rowley's unusual journey to the major leagues culminated in a sharp debut and a standing ovation Saturday, as the rookie led the Toronto Blue Jays to a 7-2 win over the Pittsburgh Pirates. 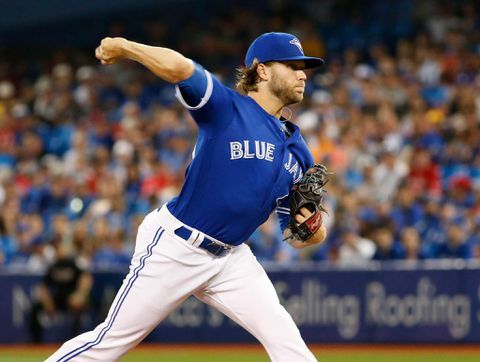 Rowley, who missed the 2014 and 2015 seasons to serve active duty in the U.S. Army, gave up one run in just over five mostly trouble-free innings as the Blue Jays (55-61) evened their three-game series in front of 46,179 under a closed Rogers Centre. He admitted he was nervous a night before the game and anxious Saturday morning. With his parents and sister in attendance, the 26-year-old eventually settled his nerves but conceded that he got a "little emotional" during the crowd's boisterous sendoff. "You have 45,000 people standing on their feet – that's the first time I've ever seen that in person. That's pretty cool," he said. "[My family is] obviously very emotional right now," he added. "I'm looking forward to spending the rest of the day with them." Rookie right-hander Trevor Williams gave up four runs (three earned) over six innings and Jordy Mercer hit a solo home run for the Pirates (58-59), who had sailed to five wins in their last six games heading into Saturday's matinee. Outside of allowing a Josh Bell triple in the second (which eventually resulted in a run) and a pair of hits in the sixth that chased him after 75 pitches, Rowley looked dependable in his debut. He scattered five hits and only one walk over 5 1/3 innings. "Awesome, really," Blue Jays manager John Gibbons said of his performance. "We've been looking for that. "A debut is never easy," he added. "But I thought he did a tremendous job. He ought to feel proud of himself." The Blue Jays wasted no time getting to the 25-year-old Williams, who was coming off his best start of the season against Detroit. In the first inning, Toronto turned Jose Bautista's lead-off walk into a 1-0 lead after a Justin Smoak single and an RBI fielder's choice from Steve Pearce. Pittsburgh tied the game after Bell's leadoff triple in the second, but again the Blue Jays inched ahead in the bottom half of the inning when Josh Donaldson's bases-loaded walk put Toronto ahead 2-1. The Blue Jays extended their lead to 4-1 during a messy fifth for Pittsburgh. Bautista again reached base after taking a sinker to the back, Donaldson followed with a bloop single and Pearce walked to load the bases. Although pinch hitter Kendrys Morales's ensuing ground ball to short seemed to set up a routine double play, Pirates' second baseman Adam Frazier's throw in the dirt scuttled past first base to allow Bautista and Donaldson to score. More of Pittsburgh's follies in the field helped Toronto nudge the game out of reach in the seventh. After Smoak and Pearce singled off former Jays reliever Joaquin Benoit, catcher Mike Ohlman hit a gentle grounder to third baseman Josh Harrison, who followed with a wild throw to first that scored two runs and allowed Ohlman to sprint all the way to third. Kevin Pillar followed with a sacrifice fly to make it 7-1 for Toronto. "I shot myself in the foot a few times," said Pirates starter Williams, who registered his first loss since July 18. "I didn't necessarily make it super easy on myself." NOTES: Blue Jays catcher Russell Martin was placed on the 10-day disabled list with a left oblique strain before the game. He was scheduled to have an MRI later Saturday. Left-hander J.A. Happ (5-8, 3.77 ERA) takes the mound for the Blue Jays in Sunday's series finale against Chad Kuhl (5-7, 4.53 ERA).